Professor Raffaella Zanuttini attended a workshop entitled Elements of Comparative Syntax: Theory and Description, held in honor of Professor Liliane Haegeman of Ghent University. There, she talked about her research with Assistant Professor Jim Wood on the syntactic structure of presentatives. Presentatives are sentences that introduce something new to the conversation and draw the listener’s attention to it. For example, suppose a group of friends is waiting for guests to arrive at a party. When Maria arrives, one of the hosts announces her arrival to the other hosts with the following presentative. By uttering the presentative Here’s Maria!, the speaker introduces information about Maria’s arrival to the conversation and draws the listeners’ attention to it. Syntax is the study of the structure of complex phrases and sentences. According to recent theories of grammar, the syntactic structure of a sentence is thought to include phrases encoding the contribution of that sentence to the conversation in which it is uttered. These phrases exist in layers, embedded within one another; they may be marked by the presence of certain special words, or they may be completely silent. Based on these theories, Raffaella and Jim hypothesize that presentatives are characterized by having special phrases that encode the time and location of the speaker. For example, in the presentative Here’s Maria!, these special phrases indicate that the speaker is here, wherever that may be, and that the speaker is speaking right now. When a sentence containing these special phrases (i.e., a presentative) is uttered, information about the time and location of the speaker is introduced into the conversation. Whereas the hosts of the party may have been previously talking about other events that may have occurred in the past or may be expected to occur in the future, the speaker who utters Here’s Maria! draws the listener’s attention to the here and now, so that the listener may notice Maria’s arrival. In addition to Raffaella, the workshop featured speakers from across Europe. The first talk was delivered by Liliane Haegeman herself, presenting work with postdoc Karen De Clercq of Ghent University. At the end of the workshop, Liliane was presented with a book written in her honor, consisting of a collection of papers on comparative syntax. Among these is a paper by Raffaella about presentatives in Italian. Among her many achievements, Liliane Haegeman is known for her contributions to comparative syntax—research in which the syntactic structures of various languages are compared and contrasted with one another. She is also known for her textbook Introduction to Government and Binding Theory, the authoritative introductory text on one of the many theoretical frameworks that have been proposed and developed for the study of syntax. 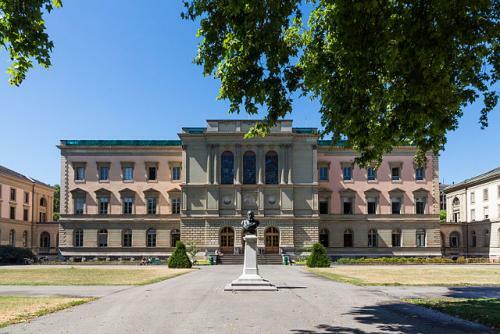 The workshop was held from November 17 to 18 at the University of Geneva in Geneva, Switzerland. Raffaella’s talk was in the first session of the second day.